The efficacy of FELIWAY has been proven in numerous clinical studies published in reputable scientific journals or presented at international conferences. Millions of cat owners around the world have noticed a huge difference in their cat after using FELIWAY; their cats feel more comfortable, stop peeing, scratching or hiding, spend more time with them, live in harmony with other cats, and better cope with changes in their home. 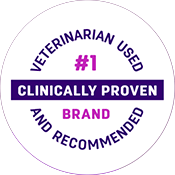 FELIWAY is used and recommended by vets. Find out more about FELIWAY.